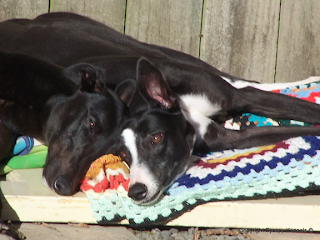 I have been involved with GAP for about 4 years now, firstly as a volunteer and currently as Area Co-ordinator for the Hutt Valley and always wondered what it was like on the “other side”; when I say the “other side” I mean greyhound racing. Sure I had seen lots of retired racers enjoying their life after racing, but what was it really like to own my own racing dog? About 18 months ago I got my owner trainers license and was on the hunt for a dog - shortly after I purchased Tino (Request Funding), a 32kg black and white boy owned by Tony Valentic and David Scott. Tino's trainers were Nathan and Angela Udy, and Hayden McCracken. 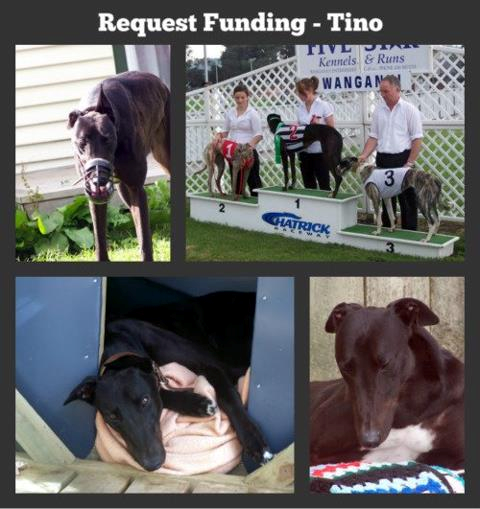 Tino had trialled at the racetrack a few times and was nearly ready for his first race. 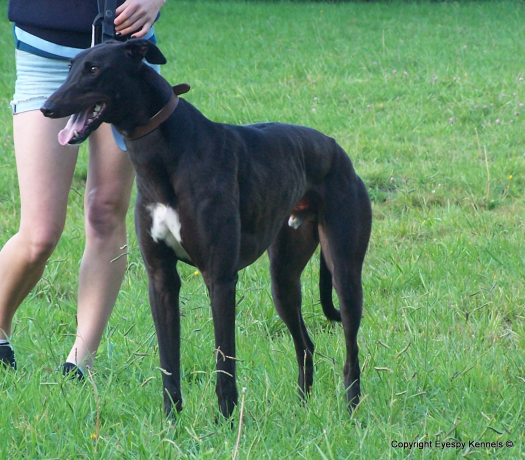 On the 4th of May 2011 Tino had his first race, I think he was a bit shell shocked at all the commotion and ended up coming 5th, even so watching your very own dog race makes your heart pound, the speed, the power is amazing. 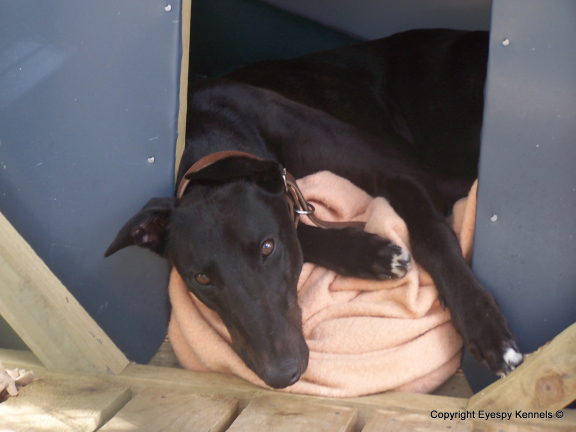 Tino relaxing in his kennel thinking about his next race! Tino is a very special dog as he was our very first racing dog. He has been used to living in the lap of luxury -- as well as performing on the racetrack he lived in the house with us along with our pets. He was very easy to housetrain and he has never had an accident inside. Tino is a lovely dog, who will fit well into a family. He is smart, cuddly, affectionate and extremely handsome. Tino will happily sleep all day on his bed while everything goes on around him. He’s a dream to walk on a lead and could even be walked around the block by me whilst I was on crutches (he’s just that easy). Tino would live happily as an only dog or with another dog as he is very social and loves to play. His favourite toy is his "Squeaky Mallard Duck" and he especially enjoys throwing it around and fetching it at the park. I’ll be extremely happy to see him go to his forever home and the family who adopts this gorgeous boy will definitely have something special!"